Scenic city posters for dorm rooms are usually of New York City or Las Vegas and are great for college dorm room decor. However, you may want something a little different for your scenic city view. Our Chicago Nights College Poster will allow you to add cool looking dorm wall art to your college wall decor and have the unique style that you want! You don't have to settle for New York City or Las Vegas if you want something a little different. Simply add our Chicago Nights Dorm Room Poster! Or for a unique look that makes your college dorm room look extra cool, you can add a couple different scenic city dorm room posters to your dorm room decor! Our Chicago Nights Dorm Poster is a beautiful dorm essentials item. It features a scenic view of Chicago's skyline highlighted with the yellow lighting. Reflected in the water below in this college supplies dorm product is a reflection of the city skyline which adds a cool effect to this dorm essentials item. The skyline in this beautiful poster for dorm rooms is black and blue which matches the sky in the backdrop. The blue highlights in this dorm room decor item makes this college supplies item really stand out. 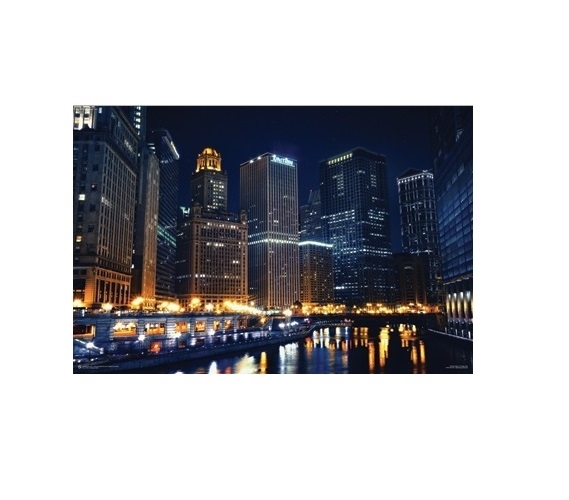 Make your college dorm room walls more fun and highlight beautiful scenic views with our Chicago Nights College Poster!